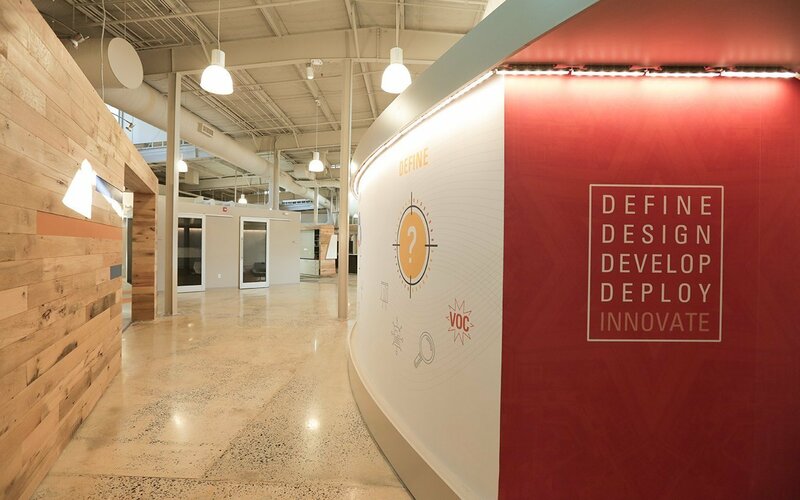 A 1980’s manufacturing warehouse becomes an innovation thinktank – a hub of intellectual collaboration and interdepartmental communication – as well as a recruiting tool. 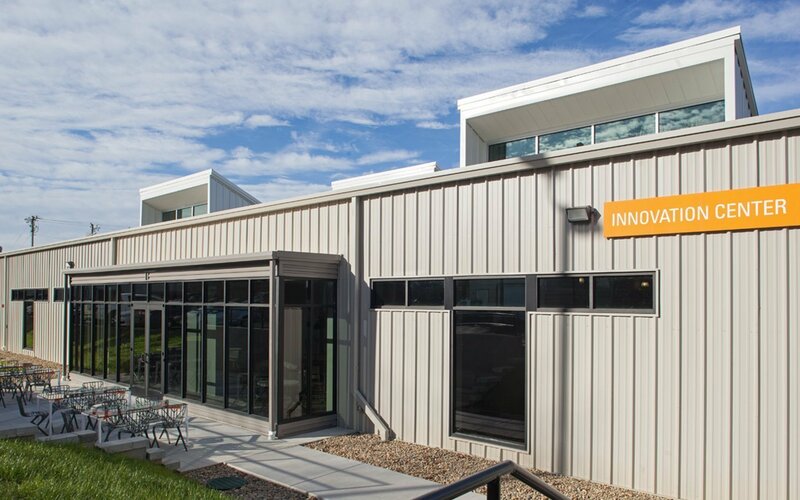 Engineers for this plastics manufacturing company were previously located across a widespread campus, allowing little possibility for collaborative thinking or interaction. 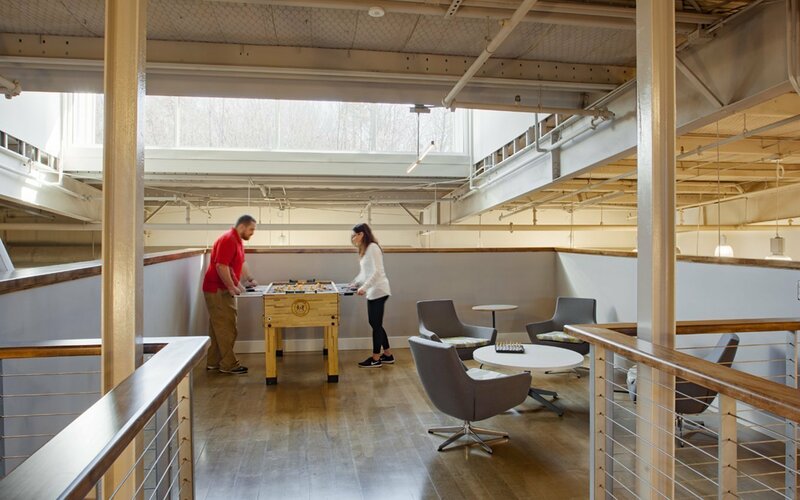 The goal: bring engineers together in a space that encourages and supports a new way of working. 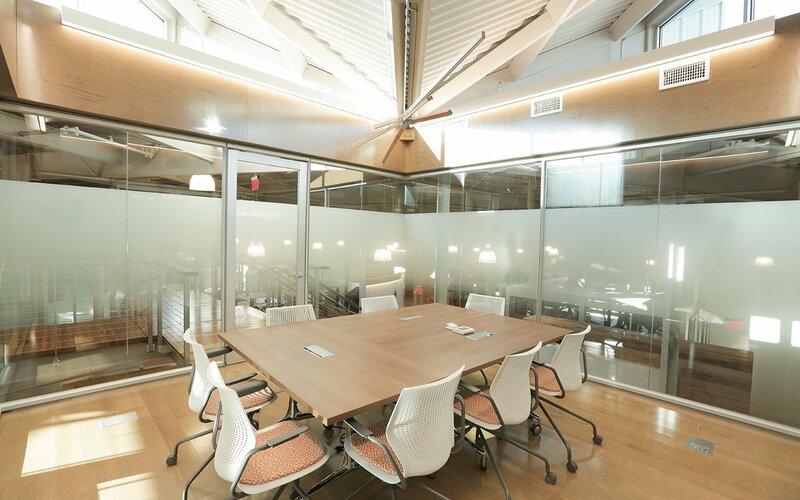 Spaces were created to increase the chance of planned and spontaneous meetings. A new mezzanine level and catwalk take advantage of the building’s original height, providing much needed additional square footage. 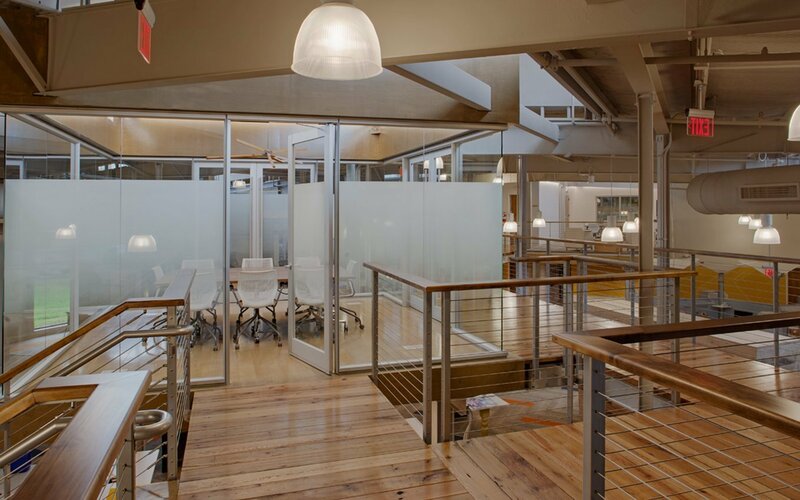 Light wells, new windows, and a small, glassed expansion bring daylight into all areas of the building. 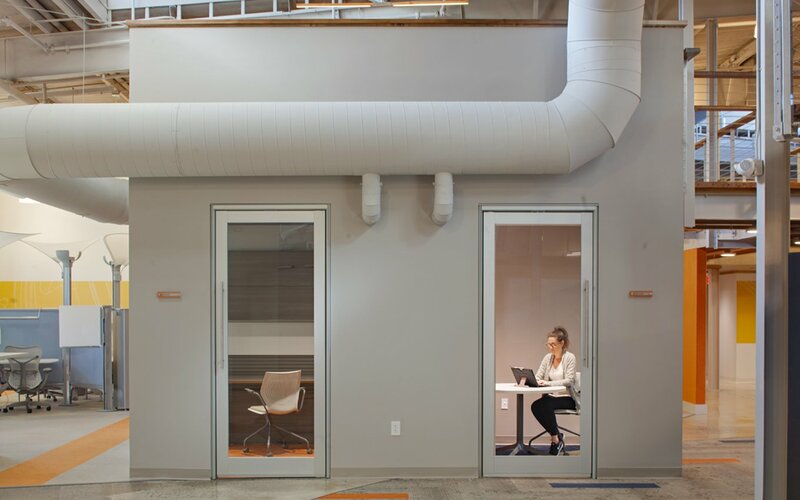 Private work/phone rooms, sofas, meeting rooms, pods and private offices provide a variety of places to work alone or collaborate with others. 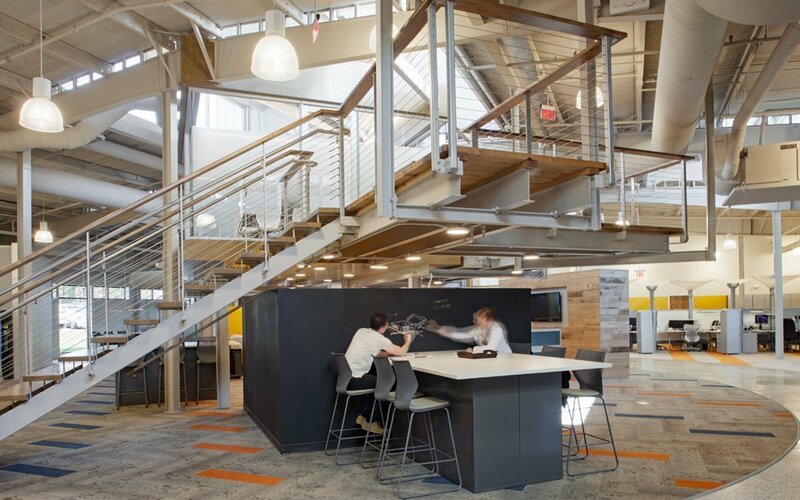 The break room and other play spaces encourage chance conversations and expanded social networks – increased collaboration and engineering efficiencies were noticed immediately. 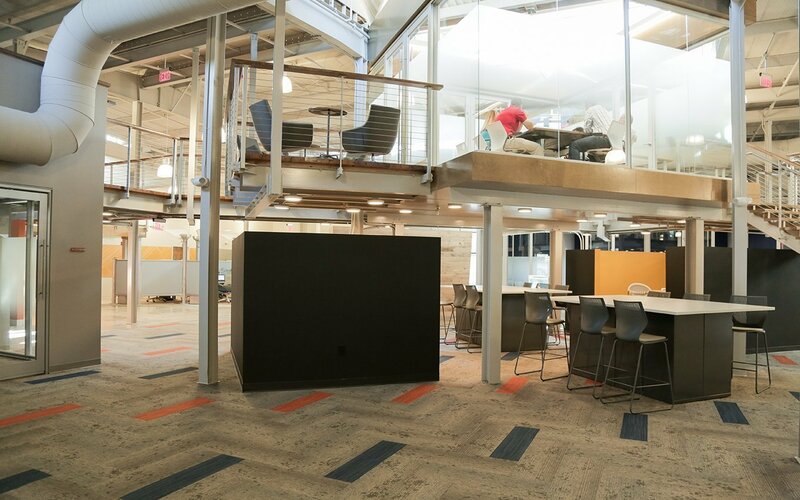 Now, Technimark offers a turnkey customer experience from creation to prototype in less than a week under one roof. Throughout, materials such as molded plastic chairs, resins, and high-gloss materials reference the material Technimark works in. Contrasting touches reflect the warm, welcoming “southern” Asheboro community and dialogue with the overall hi-tech nature of the space – workstations are intentionally off-grid, millwork is custom and often softened with angled details, reclaimed wood-clad pods and whimsical touches give relief from the high-tech, structural nature of the rest of the building. Meeting rooms named (mainly) after Marvel™ characters speak to the joining of science, play, and collective curiosity.